Aaron grew up skiing the 299 vertical foot hills in Minnesota. Since then, Aaron has discovered his passion for the backcountry while living and skiing in Utah, Colorado and New Zealand. Aaron has a bachelor’s degree in Parks, Recreation and Tourism from the University of Utah, which has allowed him to work in and experience many different parts of the world. In 2008, Aaron brought his passion to the CAIC Benefit Bash. As the co-organizer, he was able to design, organize, and run the largest fundraiser in CAIC history. Together, Aaron and Joe were able to raise over $26,000 for the CAIC and make an impact on the backcountry community. With this momentum, Aaron has been an asset to the development of the Friends of CAIC. When he is not working you can find him on his mountain bike or skiing pow. Working in the Colorado nonprofit fundraising community for over six years, Laura joined the Friends of CAIC in 2018. She holds both an MBA and MS in Management and Organization from the University of Colorado Denver and is also a US Army veteran. As an avid climber, skier and runner; her passion for the outdoors and avalanche awareness are brought to her work and Friends of CAIC every day. Laura has also held various board and committee positions for other nonprofits and enjoys volunteering. Laraine has a nonprofit background in logistics and project management both internationally and stateside. She received her Master’s in International Development from the University of Denver and fell in love with the Rocky Mountains during her time on the Front Range. She is passionate about backcountry skiing, and has spent time touring in the Chugach, the Selkirks, the Hida Range of Japan, and all over Colorado. Knox got his Master’s Degree in Atmospheric Science from Colorado State University in 1970, and then worked with the U.S. Forest Service Avalanche Research Project in Fort Collins as a snow scientist and avalanche forecaster. In 1983, he helped found the Colorado Avalanche Information Center and was its Director until retiring in 2005. In 36 years in the avalanche business, Knox was a researcher, forecaster, teacher, program director, and author, writing a couple of books and a bunch of papers and articles. He is a past president of the American Avalanche Association. Now in semi-retirement, he works with the CAIC Director as needed to keep the CAIC healthy and progressive. Bruce Edgerly is co-founder and vice president of Backcountry Access, Inc., a leading manufacturer of avalanche rescue equipment, including the Tracker DTS avalanche transceiver. Bruce has a bachelor’s degree in engineering from Brown University and a master’s degree in business administration from CU-Boulder. He is a former contributing editor to Powder and Couloir magazines and has published numerous papers for the International Snow Science Workshop (ISSW) and International Commission on Alpine Rescue (ICAR); those can be viewed at http://www.backcountryaccess.org/research. 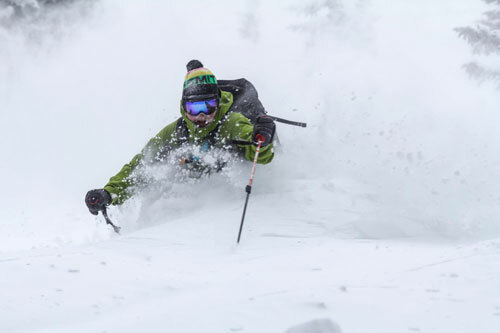 “Edge” is a dedicated backcountry skier and tours most of the time in the Summit zone, although he travels for “business” quite frequently in the Tetons, Wasatch, B.C., and Europe. He has level 3 avalanche training in the U.S., professional level 1 training in Canada, and is a qualified AIARE level 1 avalanche instructor. more floating a river in a deep canyon without cell phone coverage.